These skewers are a snap to make, and look so pretty! Not to mention oh-so-tasty! Wash tomatoes, cut in half. Cut mozzarella into bite-size cubes, no larger than 1 inch. Fold salami into fourths. Drain artichokes, cut into bite-size pieces. 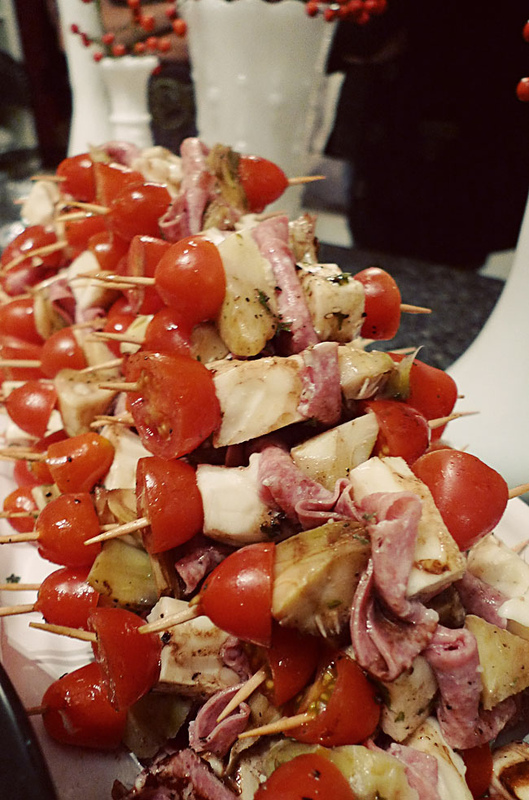 Assemble skewers on long party toothpicks (I remove the plastic frills): tomato, mozzarella, salami, artichoke, tomato. In a small bowl, combine oil, vinegar, salt, pepper, and rosemary. Whisk together until completely combined. Place one layer of skewers in a deep container, drizzle with the dressing. Repeat with remaining skewers and dressing. Store covered in the refrigerator until ready to serve (best if they can marinate for several hours).Yield: approximately 30 skewers. I'm so glad you posted this...I meant to ask you what you used for dressing. I'm dying to do the rosemary skewers like PW but I'm not sure where on earth I'd find that many. Such great ingredients, I don't know that I'd ever have thought to dress them when served this way. Looks fantastic. Gwen, trying growing it... You'll have a big bush in no time. Thanks, Joffre! It would be hard to mess up ingredients as perfect as these.